As the demand for healthy, attractive teeth increases, the methods and materials employed in restorative dentistry have become progressively more advanced. Non-metallic biomaterials for tooth repair and replacement focuses on the use of biomaterials for a range of applications in tooth repair and, in particular, dental restoration. Part one reviews the structure, modification and repair of dental tissues. The properties of enamel and dentin and their role in adhesive dental restoration are discussed, along with biomineralization and biomimicry of tooth enamel, and enamel matrix proteins (EMPs) for periodontal regeneration. Part two goes on to discuss the processing, bonding and wear properties of dental ceramics, glasses and sol-gel derived bioactive glass ceramics for tooth repair and replacement. Dental composites for tooth repair and replacement are then the focus of part three, including composite adhesive and antibacterial restorative materials for dental applications. The effects of particulate filler systems on the properties and performance of dental polymer composites are considered, along with composite based oral implants, fibre reinforced composites (FRCs) as dental materials and luting cements for dental applications. 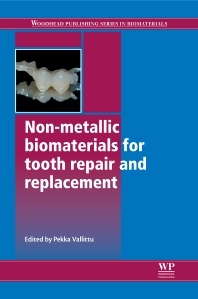 With its distinguished editor and international team of expert contributors, Non-metallic biomaterials for tooth repair and replacement provides a clear overview for all those involved in the development and application of these materials, including academic researchers, materials scientists and dental clinicians. Pekka Vallittu is Professor of Biomaterials Science as well as Chair of the Biomaterials Science Department at the Institute of Dentistry, based at the University of Turku, Finland. Dr Vallittu is also Director of Turku Clinical Biomaterials Centre (TCBC).